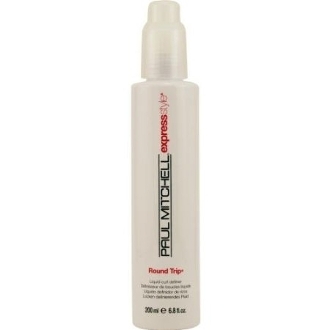 Paul Mitchell Round Trip adds lightweight detail and flexible hold to curly or wavy hair types. Clean Definition: Unique styling agents derived from natural corn starch provide weightless detail to wavy or curly hair. Long-Lasting Bendable Hold. Conditions and protects curls while creating durable body and bounce. Reduces Drying Time: Specially formulated to help reduce drying time. Directions: Protect clothing prior to application. Apply small amount to palms, working evenly through damp or dry hair. Style as desired.